For something a little different, try these Chocolate Scones. Being a fan of both scones and chocolate, I decided to combine the two. It's very easy to do, just replace some of the flour in a scone recipe with Dutch processed cocoa powder. The result is a delicious chocolate flavored scone with a rich buttery flavor and a soft and tender crumb. I did enhance the chocolate flavor by adding some chocolate chips. You can use any flavor; semi sweet, bittersweet, milk, white, cappuccino or even mint flavored chips. 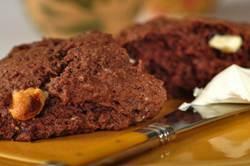 Lovely on their own or use these Chocolate Scones to make a Strawberry or Raspberry Shortcake. When you make scones do not over mix the dough, as this will result in a tough scone. That is why I prefer to make them by hand. But you can mix part of the dough in your food processor. The dry ingredients can be mixed together in the food processor and then you can add the cold butter and pulse just until you have coarse crumbs. Make sure to have your butter cold and I like to cut it into small cubes as this makes it much easier to blend into the flour mixture. If using a food processor, at this stage transfer the flour mixture to a large bowl and finish the dough by hand. Next, fold in the chocolate chips or you could even add dried cranberries or cherries or even some chopped nuts. For the wet ingredients whisk together one large egg with pure vanilla extract and some cream or milk. Depending on how rich you want your scones, you can use heavy whipping cream, single cream, hand-and-half, or even milk. Just mix the wet ingredients into the dry ingredients until you have a smooth dough, do not over mix. Transfer the dough to a lightly floured surface, knead a few times to get a smooth dough, and pat or roll into a 7 inch (18 cm) round. Then you can either cut the dough into eight wedges or use a cookie cutter to cut out rounds, hearts, or square shaped scones. Lightly brush the tops of the scones with a little milk or cream. These scones are baked until a toothpick inserted into the center comes out clean. As always, scones are at their best served warm from the oven, however they can be covered and stored at room temperature for a few days or else frozen. Chocolate Scones: Preheat the oven to 375 degrees F (190 degrees C) and place rack in center of oven. Line a baking sheet with parchment paper. In a small bowl whisk together the cream or milk, egg, and vanilla extract. In a large bowl, whisk together the flour, cocoa powder, sugar, baking powder and salt. Using a pastry blender or two knives, cut the butter into the flour mixture until it resembles coarse crumbs. Stir in the chocolate chips. Add the cream mixture and stir just until the dough comes together (add more cream and/or flour as necessary). Transfer the dough to a lightly floured surface and knead a few times. Shape the dough into a 7 inch (18 cm) round and cut into eight wedges. Brush excess flour from the bottom of the scones, and place on the baking sheet. Brush the tops of the scones with a little cream or milk. Bake for about 18-20 minutes or until they are firm around the edges but a bit soft in the center. A toothpick inserted into the center of a scone will come out clean. Cool on a wire rack. Can serve with clotted cream or softly whipped cream.